Prof. Dr. M. Aminul Islam, Former Vice Chancellor, Shahjalal University of Science and Technology (SUST), Sylhet, Bangladesh. Professor (Ex), Department of Physics, Rajshahi University, Rajshahi, Bangladesh. Professor Dr. Kamila Afroj Quadir, Ex-Director, Bio-Science Division, Bangladesh Atomic Energy Commission, Dhaka, Bangladesh. Dr. M. Monjur Ahasan, Chief Scientific Officer & Project Director, Institute of Nuclear Medical Physics Bangladesh Atomic Energy Commission, Savar, Dhaka, Bangladesh. Dr. Md. Shakilur Rahman, Chief Scientific Officer, Secondary Standard Dosimetry Laboratory (SSDL),Institute of Nuclear Science and Technology, Bangladesh Atomic Energy Commission, Savar, Dhaka, Bangladesh. Research Prof. (Ex) : Kyungpook National University, South Korea. Part-time (Prof.) : Department of Physics, Jahangirnagar University, Savar, Dhaka, Bangladesh. Dr. Tanvir Ahmed Biman, Pincipal Scientific Officer, National Institute of Nuclear Medicine and Allied Science (NINMAS), BSMMU Campus, Bangladesh Atomic Energy Commission, Dhaka, Bangladesh. Mr. Md. Nahid Hossain, Principal Scientific Officer, National Institute of Nuclear Medicine and Allied Science (NINMAS), BSMMU Campus, Bangladesh Atomic Energy Commission, Dhaka, Bangladesh. 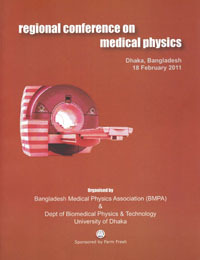 Mr. Harun-Or-Roshid, Medical Physicist, Department of Oncology , Bangabandhu Seikh Mujib Medical University (BSMMU), Shahbugh, Dhaka, Bangladesh. Dr. Muhammad Abdul Kadir, Assistant Professor and Chairman, Department of Biomedical Physics & Technology, University of Dhaka, Dhaka 1000, Bangladesh. Dr. Humayra Ferdous, Assistant Professor, Department of Physics, Faculty of Science and Information Technology, American International University-Bangladesh (AIUB), Dhaka, Bangladesh.